Feedback from you makes Staglers stronger! You can help shape our dog friendly business because your feedback and questions come directly to me. I am listening and giving you and your dogs my personal attention, guaranteeing success for us all! So impressed when my order placed in the morning turned up the next day. Happy dogs, happy me! Vets and canine specialists, recommend that antler chews are only introduced to a puppy once it has lost its first teeth and is starting to cut its adult teeth. This is usually around 8 months of age. Hi there, I have two dogs, one Labrador and one Border Terrier. 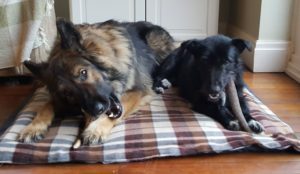 They both love Staglers and our vet says they do amazing things for our dog’s teeth. They are the best cleaner for dogs that he’s seen in all of his years work as a vet. Best present I ever bought my chocolate Labrador, two weeks later she found her own in the woods! Was very excited when hubby came back from dog food shopping with two Staglers for our Vizslas. We’d been recommended them by a mutual friend. Our girls absolutely love them! Apologies with my delay in replying. Took me a moment to work out whats happened here – I got your order on Saturday and because you were so specific about the size of chews you wanted, I actually went to the workshop and cut some fresh extra tough ones. I then took them up to the Post Office and handed them over, however I’d missed the Saturday post so they would’ve been sent out this Monday. I did have to send them 2nd Class as the weight of the two jumbo’s just went over into that bracket (2nd Class being 2-3 working days for delivery). I checked with the Post Office today and they stated that the should’ve been delivered today and at the very latest tomorrow. Can we please just wait to see if they come tomorrow, and could I also please ask you to check anywhere that the postman might have left them, or with neighbours etc. Look forward to hearing from you, and apologies that your chewer’s are still waiting. Hi John, just wondered if there was a problem with the huge antlers i ordered ? as i havnt received my delivery yet, and I have 2 chewers awaiting their new antlers !!! Thanks for the prompt service, as usual. Dogs very happy! See attached below to These are really fab chews! read. New foster dog Jamie with Sam and Rhonni on the green bed. 9″ antler dog chew arrived today, very quick delivery. Great friendly advice was given before I purchased. Antler is so substantial and best I’ve seen and my Labrador is delighted with it. Thanks, after wasting money on other products, finally I’ve found a long lasting chew for her that is good for her and she’ll get hours of enjoyment from it. I buy Staglers for my sons Paterdale and my daughters Labrador, they both love them but when they are both here at the same time it’s like musical chairs as the Labrador always wants the other chew so I end up with terrier on my lap and I have to hold on to his chew while he holds my hand and has a good chomp (at the antler). Thank you for your excellent service and amazingly quick delivery. I have two Border Collies and they love their antlers and I like them even more, no noise, no mess, no smell ! Our dog Snoop loves his Staglers. He has a Jumbo one and being a Staffador it keeps him happy for ages. My little dog is the size of a Jack Russell and his initial experience with a Stag antler was my friend’s Rottweilers jumbo one 2 years ago. He claimed it as his own, dragged it round and gnawed it down to just 1″ in a fortnight (a record I am sure but he did go at it with vigour for at least 5 hrs each day)! I’ve never looked back since…..now he always has 3 or 4 to choose from at any one time and still loves them. I would never recommend anyone buy them from any other source than yourselves as your prices and the quality of the product is far superior. Staglers are a first class and first choice dog chew our Glen of Imarl cross Dandy Dimott terrier she absolutely loves them . All 7 of our dogs loved Staglers Antlers from a an early age , which is why they don’t have any dental problems ! Clean teeth & no smelly breath !! 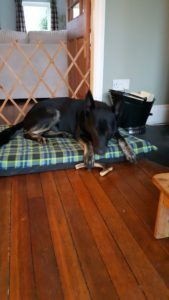 Dogs love Staglers chews they make short work of most things and although a bit more expensive Staglers definitely last so great value for money!